We Are WRAS: A Special Broadcast, June 26 at 1 p.m.
On Thursday, June 26th, WRCT will join college radio stations across the country to unite and say “We Are WRAS,” as WRAS, the college radio station of Georgia State University, offers an unprecedented radio simulcast to highlight their fight to remain a student-run radio station. For one hour, starting at 1 p.m. EDT, from coast to coast, listeners will hear the Atlanta-based station on their own college radio station as participating stations show their support for WRAS. On May 6, 2014, the WRAS staff was informed of a deal made unilaterally between Georgia State University and Georgia Public Broadcasting that will replace WRAS programming with GPB news programming from 5 a.m. to 7 p.m. daily. Peter Kreten, President of College Radio Day, states, “In this hour program, WRAS will show just how much of an impact they have made in their 43-year history and why it’s important that they should continue to be student-run.” The program will also include audio messages of support from many of the participating radio stations. “Many college radio stations throughout the country want WRAS to know that they are not alone during this time,” added Kreten. Please tune to WRCT Pittsburgh this Thursday at 1 p.m. to show your solidarity for student-run college radio broadcasting. WRCT is proud to stand by WRAS in this uncertain time for the members of that station. The issue currently facing WRAS is quickly becoming an issue that college stations around the country are liable to face. Join WRCT in saying to everyone listening, “We Are WRAS”. 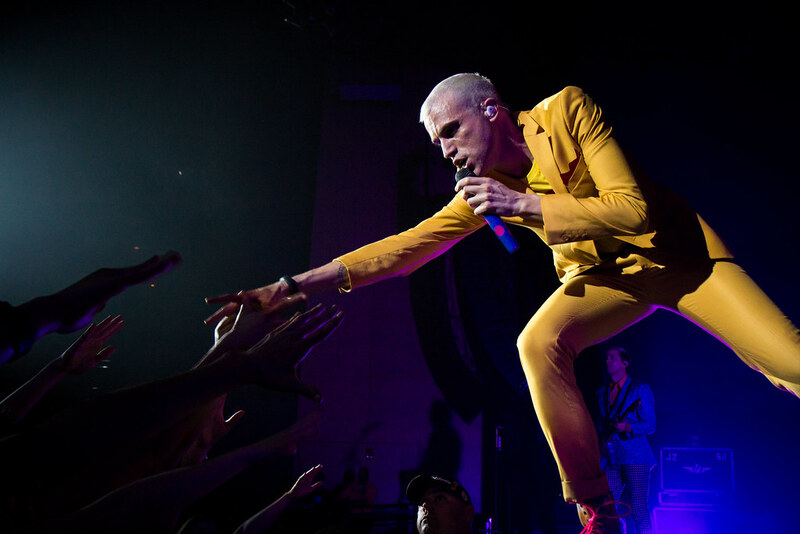 Neon Trees came to town about three weeks ago, the third stop of their headlining Pop Psychology tour, which kicked off at the beginning of May. 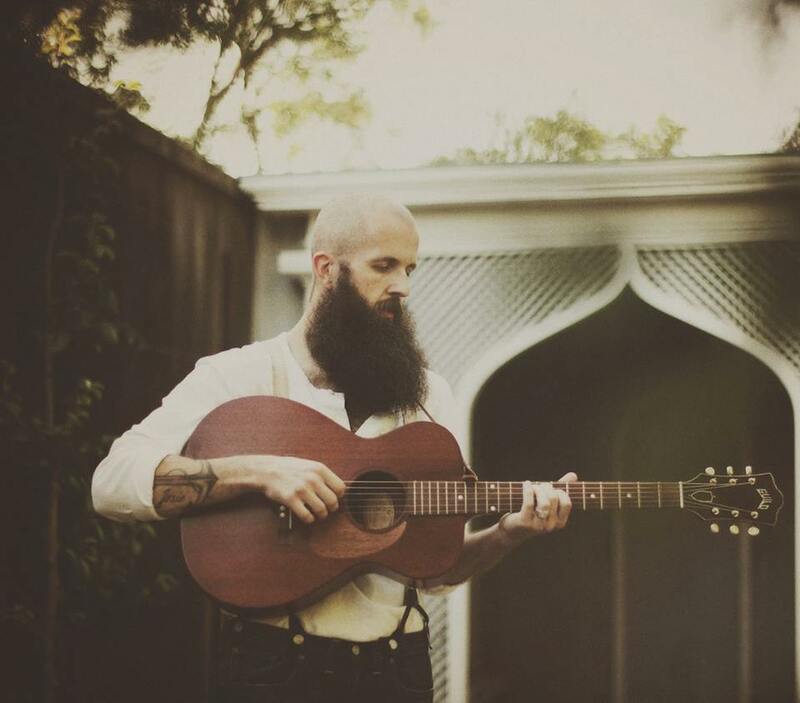 They were supported by upcoming artists Nightmare and the Cat and Smallpools. Pop Psychology is Neon Trees’ third full-length studio album that was released in late April. The last time I saw Neon Trees was back in January 2011, my senior year of high school, at Webster Hall in Manhattan’s East Village. At the time the Utah-based pop band had released only one full-length album, Habits. “Animal” and “1983”, two tracks off Habits, are arguably Neon Trees’ most popular tracks of their early repertoire. Despite their limited assortment of material, they put on a truly electric show and front man Tyler Glenn’s personality still sticks out in my mind years later. I will admit that I stopped listening to Neon Trees regularly once I hit college in fall 2011. They kind of fell off my radar as I started listening to other artists and I knew that they were coming out with new material, but I was interested in different genres of music at the time. Fast forward to spring 2014, when I found out that Neon Trees was coming to Pittsburgh. For a while I was debating whether or not I wanted to go since I hadn’t listened to them in such a long time. It’s as if I didn’t deserve to go because I was completely unfamiliar with everything that came out after Habits. I then recalled how much fun I had at their concert from 2011 and I made the decision to attend. The next step was to listen to their more recent tunes, a task that ended up being way more fun than I had anticipated. In a span of three years, Neon Trees had released two more albums: Picture Show in 2011 after I had seen them and Pop Psychology less than a month earlier. I quickly warmed up to Picture Show with its catchy 80s-influenced songs and a fantastic cover of The Human League’s “Don’t You Want Me.” When Picture Show came out in 2011, “Everybody Talks” quickly climbed the charts and remains one of Neon Trees’ most renowned songs. Pop Psychology took a little longer to get used to, for it was so drastically different than their stuff from Habits. Don’t get me wrong, I do like Pop Psychology. It’s a cohesive album that shows a lot of potential to grow in popularity over time. The concert was at Stage AE, located along Pittsburgh’s north shore. Nightmare and the Cat took the stage first and I thought they were…okay. I have seen a lot of concerts, and my opinion is probably more objective than most. Needless to say, they weren’t downright horrible; I just think they need to grow as musicians a little bit more. Smallpools was up next and certainly did not disappoint. I had seen Smallpools once before when they opened for Twenty One Pilots this past November in Philadelphia. Although they have only released one EP, it was apparent that they have already garnered a pretty solid fan base. I am eager to see what Smallpools will produce in the coming years. In between Smallpools’ and Neon Trees’ act, a large white sheet was draped across the front of the stage, obscuring everything behind it. It then occurred to me just how Neon Trees has grown in a short span of three years. 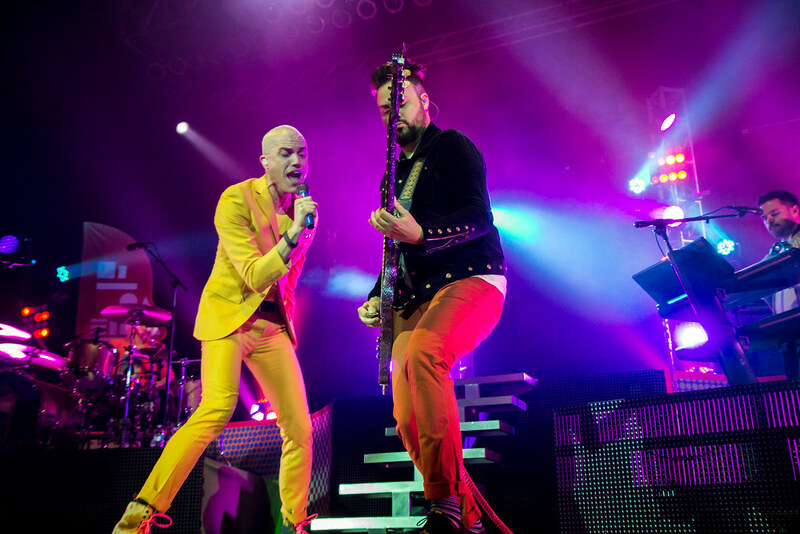 When I saw them at Webster Hall in Manhattan, they had a minimal stage setup with a simple backdrop that read “Neon Trees.” Now, their stage consisted of a multi-level set fitted with large LED screens, stairs, and illuminated by countless lights. Neon Trees finally came on and started to play the song, “Lessons in Love (All Day, All Night),” from Picture Show from behind the sheet. I could sense the anticipation building up within the crowd until the sheet finally fell in the midst of the first chorus. 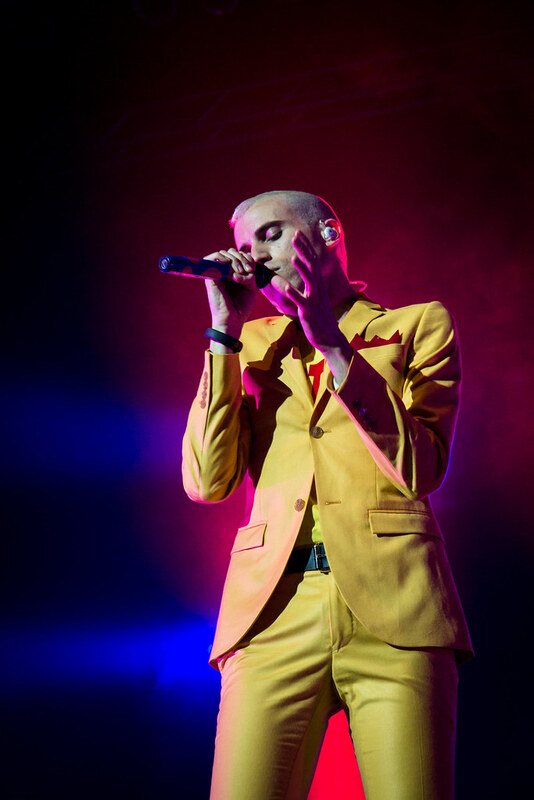 At the sight of Tyler Glenn, who stood fearlessly in his brilliant yellow suit at the center of the stage, the crowd instantly burst into cheers. Neon Trees’ set list for the evening mainly featured songs from Pop Psychology as well as a number of tracks from their previous two albums. They played a slowed down variation of “1983” and I was ecstatic when they started to play their cover of “Don’t You Want Me.” One song I was particularly impressed by was the live version of “Unavoidable” off of Pop Psychology, a song I felt indifferent about prior to the concert. Tyler Glenn and drummer, Elaine Bradley’s, duet was quite charming! There was never a dull moment throughout the entire show. The band’s engaging stage presence, frequent costume changes, dramatic lighting kept the crowd going all night. I would highly recommend seeing Neon Trees if you already haven’t. The next time they’re in town; I will not hesitate to decide whether or not to attend, I’ve already made my choice. Big thanks to Shannon Cosgrove and Lindsay Field of BB Gun Press for making this possible!